As some of you are aware IBM has been creating a large number of local meetups around BlueMix. 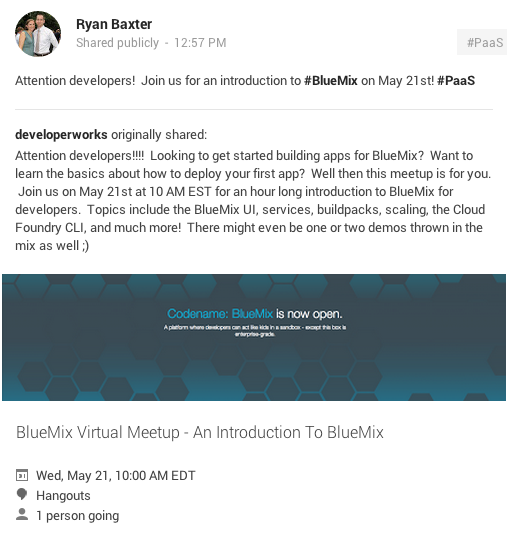 I know that not everyone can attend these for one reason or another so I thought why not try to have a virtual BlueMix Meetup? Our first virtual meetup will be on May 21st at 10 AM EST. We will be using Google Hangouts and the recording will be available on YouTube if you can’t make it. For this first meetup event your presenter will be yours truly and I will be giving an introduction to BlueMix for developers. That is right, this meetup will be developer focused! After all, developers are the main users of BlueMix :). I plan on giving an introduction to the basic topics and concepts every developer will need to know to get their first app deployed on BlueMix, there might even be a demo or two ;). If you are at all interested in using BlueMix I suggest you join. Click the image below and respond Yes! on the event page to indicate you are going. Please feel free to re-share, Tweet, and blog about this event, the more attendees the better the event is for everyone!